Bay windows were a popular home renovation upgrade in the 1870's. The first deed dated April 9, 1833, is from the Trustees of the Free Schools in the South Parish of Andover who sold a four acre parcel with buildings to William B. Lovejoy for $200. The deed was signed by Benjamin Jenkins the president of the trustees. It is interesting to note that in 1933 there were only four houses on Lovejoy Road, two on the west side and two on the east side, all listed as farms. William B. Lovejoy married on Jan. 29, 1834 in Andover to Mary Ann Clement. Two sons, Benjamin C. b. Jan 10, 1842 and Bailey b. Oct. 5, 1846. William B. Lovejoy sold the property for $145 to Ebenezer Lovejoy, Carpenter, on April 27, 1836. Three years later Ebenezer and wife Phebe, sell to their son John Lovejoy, also a carpenter, on Nov. 13, 1839 for $200. John Lovejoy’s Will, was written on April 26, 1876 and directs that the property should go to his wife Mary F. with life tenancy, after her death, to his daughter, Mary Frances (Lovejoy) Noyes (wife of Henry Alfred Noyes). If daughter Mary dies the estate would go to her children if they had issue, and if not then the estate would go to the Missionary Association of Freedmen. Wife Mary F. Lovejoy died on March 3, 1880 and John lived in his home until his death on Jan. 10, 1899. Daughter Mary Frances Lovejoy b. July 28, 1837 inherits the property with her husband Henry Alfred Noyes moved in to care for her father. Henry or Alfred, as he was known by, was born in Andover, bpt. Oct.9 1842, son of Wadleigh & Phebe (Ballard) Noyes. Alfred was a machinist and died Aug. 29, 1887 at age 46y 2m 10d. Mary Frances died on Nov. 12, 1911. They had one son John Lovejoy Noyes b. Oct. 30, 1874. John Lovejoy Noyes married on Aug. 5, 1897 to Annie Elizabeth Dufton b. 1879 in Lawrence, MA daughter of George & Lousia (Spender) Dufton. They had four children; son John Dufton b. 1899 d. July 29, 1926 of cancer, (perhaps related to an injury from a kick by a horse, as related by family member John Noyes in 2012. ), daughters Mary Louise b. 1903 d. Sept. 22, 1959, Phebe Elizabeth b. 1905 d. 1966 and Mina Ballard b. 1907 d. 1976. Their mother Annie Elizabeth died on Oct. 7, 1916. John remarried in 1919 to Carobel G. b. 1878 in Pennsylvania. Noyes family owned the farm for 68 years until John’s death in January 1967. The property was inherited by his daughters. 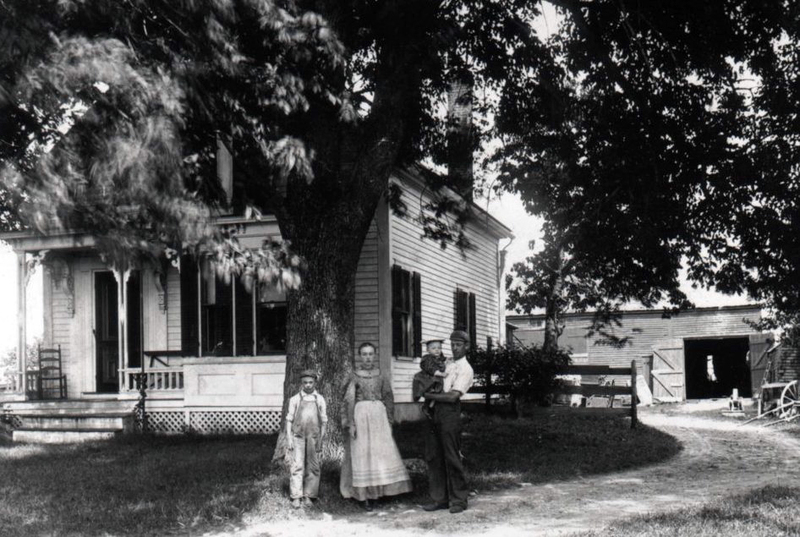 The three sisters were the last of the Noyes family to live in the house. Mina was a teacher, graduate of Salem Normal School. She was elected in 1928 in the Andover Public Schools, teaching 2nd and 3rd grades at Bradlee School in Ballardvale 1928-1941 and at John Dove, Stowe and Central Elem. 1941-1968 as a 5th grade teacher. Mina died in 1976 the last daughter to live in the house. 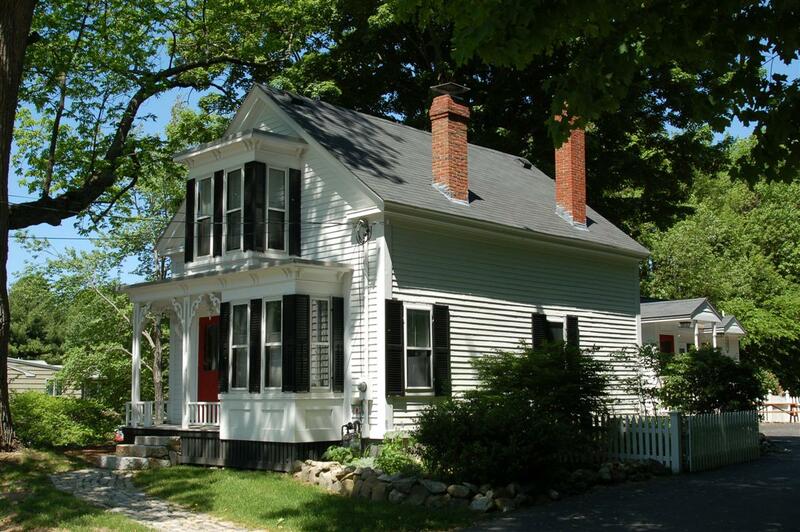 The house has been well cared for and maintained through the years. The house contains, three working fireplaces, custom wood floors on both levels and many of the original windows have been restored and preserved. The kitchen has the original pantry, built in hutch, and evidence of a former stove flue in the chimney. Original staircase and banister along with the front porch scroll work and asymmetrical bay windows all add to enhance the charm of what may have begun as a plain and simple farmhouse. The house remained with the Lovejoy family for 144 years from 1833-1977. Trustees of the Free Schools in South Parish, Benj. Jenkins, pres. Acreage 1.42 acres. Approximate frontage 541'.